I'd like to wish yous all a very Happy New Year!! *Cheers* Hip Hip Hooray! I hope 2012 brings you happiness, laughter, fun, love and loadsa good books! ﻿Today I've decided to do a little 2011 round-up of Interviews and Reviews of the past year! 2011 has been one of the best years ever! I got to connect with other wonderful bloggers and authors! I've had interviews with Paige Toon, Hope Sargent, Jennifer Laurens, Nina-Marie Gardner,Terri Long, Jana Oliver and MORE! Breaking Dawn Part 1 was released! EDWARD!! HEADBOARD! Below in a full list of authors who have all been featured on my blog and if you click on their names you will be brought to their interviews! Enjoy! I've also reviewed loads of books so the link below brings you to the page of my full list of reviews! My Top 10 books of 2011: These are not in order of preference, the following 10 just stand out for me as best reads. What are your favourite books of 2011? Sadly I didn't succeed and read my challenge of 50 books for 2011 but ﻿for 2012 I'm hoping to read 150! I know what am I doing! ahhh! What are your reading challenges? Breaking Dawn Part 2! Ahhhhhhh!!! Loads of new books being released! Also mentioned in the title is 2012 Surprises so I've decided to share a little of what's coming up in 2012 on Reading A Little Bit Of Everything! Each Month in 2012 an author will be highlighted with quite a major giveaway. Jane Green will highlight January with an Exclusive Interview and Giveaway plus Reviews all month! 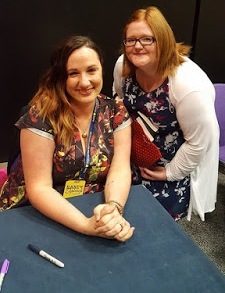 Also if you are over the age of 18 then you are also very welcome to follow my A Redheads Guilty Reads blog which will also highlight an author each month and January is Nina-Marie Gardner with an exclusive Giveaway. What have been your highlights from 2011?? What's been your favourite books? Movies?? What are you most looking forward to in 2012? Congratultions! You have had a great year! I have been wanting to read In Leah's Wake- and hope I have a chance soon. I have a whole pile of books that I am making my way through. Like you, I started my blog in 2011. Considering it has been less than a year- it has come a long way. My favorite book was probably either The Hunger Games or The Curious Incident of the Dog at Night (I know neither came out in 2011- but I recently read both of them and loved them). In 2012 I am looking forward to blogging, reading, and writing my second book! Best of luck in 2012- looks like you will be doing a lot of reading! Nice roundup...great year for you. Mark your calendar for a giveaway on my blog for THE WICKED WIVES by Gustine Pelagatti. Hope you can stop by for the giveaway.